A must watch film for every Indian to witness India’s heroic role in Bangladesh Liberation War. Operation Searchlight was a planned military operation carried out by the Pakistan Army in March, 1971. This was the first official engagement of Indian and Pakistani air forces during the Bangladesh Liberation War. The vital Battle of Basantar aka The Battle of Barapind started in the western sector of India. The first major engagements in the Western Sector of India along the border posts of Longewala, Thar Desert in Rajasthan. The Tangail Airdrop was an airborne operation mounted on 11 December 1971 by the 2nd battalion of the Indian Army's Parachute Regiment during the Indo-Pakistani War of 1971. 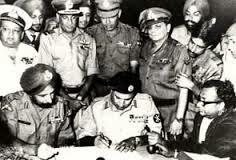 On December 16, 1971 Lieutenant General of Pakistan Niazi surrendered and a new country Bangladesh emerged.